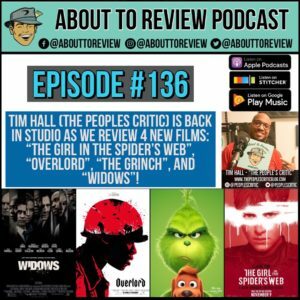 Tim Hall (@PeoplesCritic) is back in the studio as we review four new movies which are in theaters now! Reviews include “The Girl in the Spider’s Web”, “The Grinch”, “Widows” and “Overlord”. A very wide range of films are discussed on this week’s episode, ranging from the family friendly relaunch of the classic “The Grinch”, then leading up to an intense World War 2 action/ horror movie that features both real and imagined monsters!